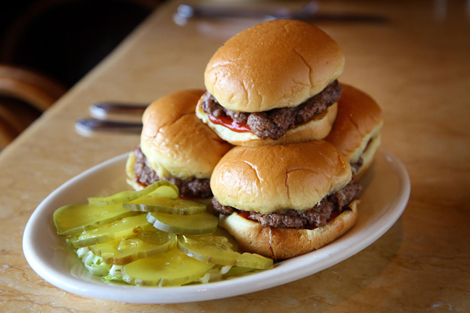 The truth is, most restaurants try to pass off mini-burgers as sliders. Patty scholar George Motz weighs in on the differences between these two forms, and why you shouldn't dismiss the the popular franchise. George Motz is a reputed burger scholar, filmmaker, and author of Hamburger America. You can follow him @MotzBurger. Chances are you’ve heard of both the slider and the mini-burger, and probably wondered what the difference was, if any at all. Hamburger cognoscenti have argued the topic ad nauseam, and the conclusion is that, YES, of course there is a difference! The time has come to set the record straight (again), and also to shed light on a little-known advocate of the slider’s authentic form: The Cheesecake Factory. A mini-burger is exactly what it sounds like—a tiny version of the classic American patty-cheese-and-bun combination. It’s a scale-model reproduction that could even be called ‘cute’ due to its shrunken proportions. Mini-burgers are usually found at fancy parties, where they’re served as passed hors d’oeuvres; they are rarely any good. By the time a mini-burger has been fussed over in the catering kitchen, placed on a tray, and paraded around a party, it has become cold and lifeless. Few have figured out the science behind the perfect mini-burger, and some of the best I’ve had were served at high-end restaurants as an appetizer. They are usually served three to an order, which calls into question their usefulness: Why not just get a full-sized burger and call it a day? 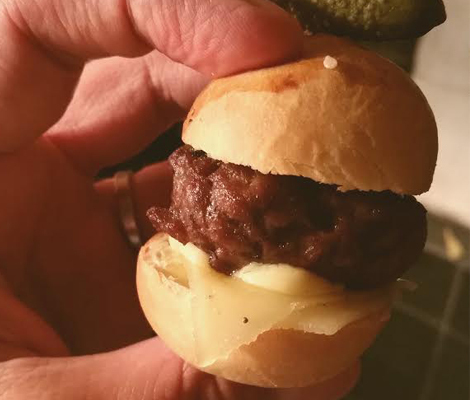 Mini-burgers are difficult to produce because the cook must work in miniature—all of the proper elements are a fraction of their normal size, including cooking times. A slider is far more than the sum of its parts, and is arguably the most historically significant burger ever created. It is a confluence of method, history, and flavor. It bears the weight of 100 years of proletarian sustenance—a simple comfort food for the wage earners of America. It is considered the original hamburger, the one that begat all that followed. Yes, this is that burger, and it crushes the influence of the mini-burger to bits. For starters, the slider is a small burger. To qualify, its patty size is a diminutive 1.5 to 2 ounces. Ask for ‘double meat’ at a classic burger joint, and you’ll get just that—two tiny balls of fresh-ground beef pressed into approximately one three-ounce patty. The slider bun is an uncomplicated, white squishy bun that, in most cases, finds itself on or near the griddle, warming to a supple softness. Sometimes the buns are actually placed directly atop the sizzling patty to steam directly. Which brings me to cooking method: Sliders are cooked only one way—smashed thin on a flattop griddle. 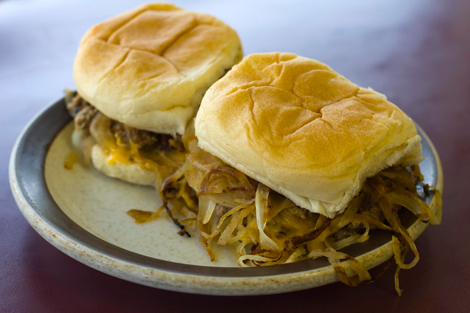 The most authentic sliders have thin-sliced or diced onion pressed into the patty at the outset, usually applied with a stiff spatula and some muscle. As the onion cooks, sweet liquid is released directly into the patty, mingling with the rendered beef to create a flavor profile unique to the roots of American gastronomy. There are various accounts of the slider’s etymology; one common one points to their ability to ‘slide’ down your throat. Another version I’ve come across is that in the early days of hamburgers, short-order cooks at tiny burger joints would ‘slide’ a plate of burgers down the counter to a waiting customer, a flourish that helped define the nature of fast food. Today, authentic sliders that contain the DNA of the original can still be found all over America at places like Power’s Hamburgers in Fort Wayne, Indiana; The Cozy Inn in Salina, Kansas; and White Manna in New Jersey, among others. Walking into these places is a complete time warp because things rarely change in real slider emporiums. If you find yourself too many miles from the nearest slider joint, I have a solution that may blow your mind—stop into your local Cheesecake Factory. You heard that right. While most restaurants continue to pass off mini-burgers as sliders, The Cheesecake Factory is one of the few places to serve them in their traditional form, the way America was meant to enjoy them. I was skeptical but curious after learning from the large restaurant chain’s Chief Culinary Officer, Donald Moore, that the appetizer listed as ‘Roadside Sliders’ is unquestionably the most accurate re-creation of a slider outside of a greasy spoon. How did that happen? Because Cheesecake Factory CEO David Overton was raised eating the real thing. 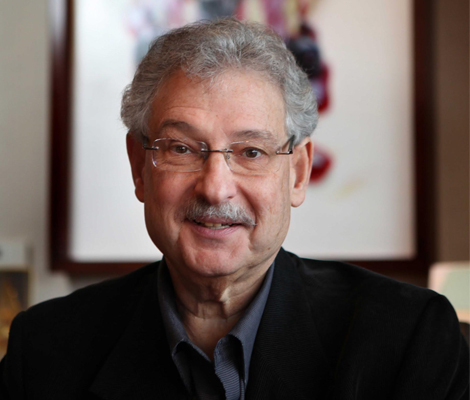 “I grew up three blocks from Greene’s Hamburgers,” he told me over the phone. “I would take my paper route money and spend it on burgers.” Greene’s, for those not well-versed in the American burgerscape, is a primary-source burger counter outside of Detroit. When Overton opened his first restaurant in Los Angeles in 1978, he was determined to re-live his youth and serve the burger that he remembered. “I was going to make the best darn burger I could,” he said. “And I knew that if I liked something, others would too.” He was right. Sorry I didn’t give equal space here to the mini-burger. Frankly, it doesn’t deserve it. To call yourself a true American, put down that mini-burger and go find a slider. And remember, if you can’t locate a classic burger joint like Greene’s or Power’s, know that your local Cheesecake Factory will do it justice.